7-Eleven To Withdraw From All S'pore Shell Stations By End-2017: Good Foresight Or Bad Move? Where’s that quick fix you need when you get hungry in the middle of the night? In times of emergencies, like when a girl urgently needs to get a menstrual pad, or when a driver forgets to restock on his parking coupons, or when you wear a new pair of shoes out and you get a blister; a brightly-lit store with its fluorescent sign beckons. That familiar fluorescent sign and its bright, white lights is a common sight in our lives. While people commiserate on the death of retail (with varying levels of melancholy), there are certain industries that won’t fade into redundancy because of cashless payments and the rise of e-commerce – such as 7-Eleven. 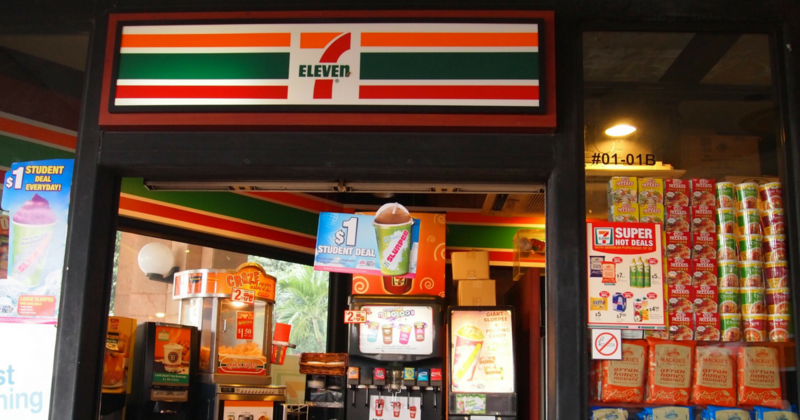 Early this October, Shell has announced that they will be ending their 11-year partnership with convenience chain store 7-Eleven. Multiple sources have reported that the divorce is due to its plans to rebrand and revamp its “petrol station convenience offer to align with its ‘long-term business strategy'”. Shell Singapore said that this “would allow it to focus on more profitable activities”. Perhaps by bringing in its own Shell Select and Deli by Shell brands into their own petrol stations, starting with the opening of the Shell Tampines Avenue 2 station. Since 2006, the two companies have carried over the petrol station/convenience store trope from the West to Singapore. The contract will officially be terminated by the end of this year, according to Marketing Interactive. Currently managing over 400 7-Eleven stores, a Dairy Farm Singapore spokesperson said that they “respect their business decision not to renew the alliance arrangement in view of their plans to align their operations here”. The convenience store has about 90 years of history, according to its corporate page, it began with “Uncle Johnny” Jefferson Green in 1927. Founded in Dallas, Texas, he noticed that people had to travel a distance to grocery stores and general merchandisers to get basic food provisions such as eggs, milk, and bread. So he came up with the idea of convenience stores so such necessary provisions are more accessible to the people. Working in an icehouse was to his advantage, because of the cooler temperatures, food was still fresh. In 1928, the convenience store was renamed to Tote’m Store because customers simply “toted away their purchases”. In 1946, they changed their name to 7-Eleven “to reflect their new store hours” which was “unprecedented at that time”. But it was only in 1963 that they had changed their operating hours to 24 hours because one of the stores “near the University of Texas got so busy after a football game“. That Texas store realised how lucrative it was and decided to stay open 24/7. Now, they have stores all over the globe, with Japan being the country with the most 7-Eleven stores. In 2005, a Japanese holding company, Seven & I Holdings Co., Ltd., became the parent company of 7-Eleven. Singapore currently has 422 7-Eleven stores, making it the largest chain of convenience stores in the country – and it still is. Marketing Interactive has written an elaborate piece supporting Shell’s separation from 7-Eleven. The writer collected sentiments from industry professionals who approved of the move, saying that Shell now has “57 more touch-points to engage and connect with consumers… which it was unable to do before because it had no control of customers entering another retail environment”, said Jane Perry, the managing director of Geometry Global Singapore. Simon Bell, managing director of FITCH stated that if executed well, Shell can own its branding and yield its retail power to its benefit. To me, Shell is focusing on Shell (or finding new partners such as McDonald’s) that will assist it to achieve this. The point of difference will come in how the new relationship (whether convenience store, fast food or something else) can complement and enhance the Shell forecourt and station experience. In a nutshell, Andrew Crombie, brand consultant and former CEO of FITCH Southeast Asia and North Asia summed it up well; Shell has a “huge opportunity to gain first-mover advantage in reshaping the overall mobility and convenience offer against other fuel brands” by creating a “seamless end-to-end experience”. While Shell might have taken back their own narrative by booting out 7-Eleven from its petrol stations, other opportunities have also presented itself to 7-Eleven. 7-Eleven has plans to open 30 more stores across Singapore by the end of this year and 50 more by next year. At the moment, it has at total of 422 stores including the 56 in Shell stations. This should bring the total number of 7-Eleven stores to 446 by 2018. For the Dutch petroleum giant, however, its number of petrol kiosks in the republic has dropped “from 222 in 2003 to around 170 today”. In any case, choices for drivers to top up fuel are not limited and convenience stores like 7-Eleven do not seem to be dwindling. For us consumers, I guess we still stand to gain. But it is hard to determine who has won in this case – Shell or 7-Eleven? Sure, Shell might have full control over retail space now, but 7-Eleven seems to be unfazed by all of this. Do you agree that 7-Eleven has suffered a loss, or do you think that Shell should have continued their long-standing partnership?